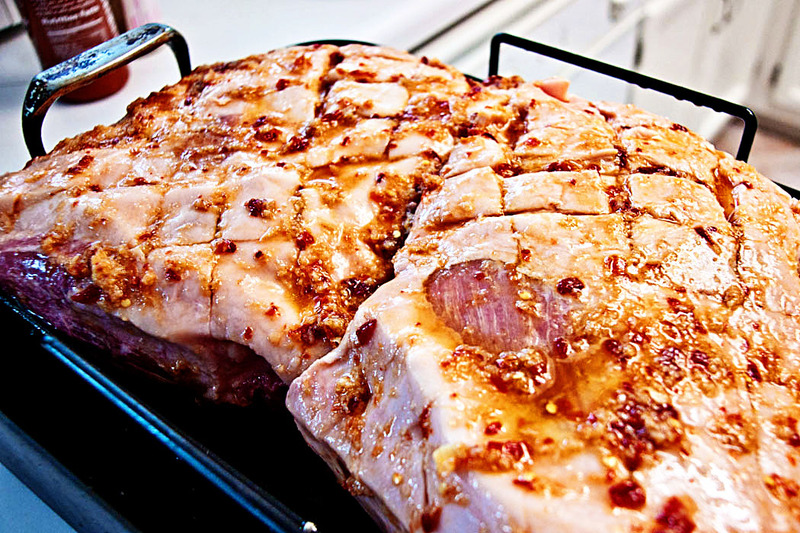 Posted byendlessappetite	 June 24, 2011 June 24, 2011 1 Comment on Porkarific–24 Hour Roasted Pork with Asian Flavors and What to do With it! I know, I know. It’s been a while since I’ve posted. We’ve been on what a close friend dubbed, “A World Tour”. While we didn’t literally travel around the world, we did keep our suitcases at the ready for a good two weeks with travels with friends, to visit family, and to work/celebrate the marriage of wonderful friends. As soon as we returned home, it was time to celebrate a joint birthday (my friend, Tammy and I), our first anniversary, and father’s day. I cooked this delicious pork for our shared birthday and as it is an outstanding recipe for any sort of gathering, no matter the weather, I thought you might want to try it. I also realized that I haven’t posted any meat recipes yet. We don’t eat a lot of meat around our house but when we do, we like to go big! This Pork Shoulder is definitely not what you would call, “lean and mean” but tender, juicy, and succulent with crisp bits of rendered fat and chewy, flavorful bark. When it cooks, it fills your house with an aroma so inviting, so tempting, so mouth-watering that you find yourself inadvertently drooling. It drove my poor dog, Lucy nuts. She circled the oven for the full 24 hours, casting longing looks at the stove. On a sidenote, some of you may be thinking to yourself, “24 hours, that sure does seem like a lot of work”! Au contraire, my friends–you only have to invest about 30 minutes of active time in this beauty of a roast. I’ve also included two, yes two sauces and a slaw that compliment the pork and make for adventurous and diverse leftovers. There is a bit of flexibility when it comes to cooking times with this recipe. I’ve cooked a shoulder overnight (for about 12 hours) and for the full 24 hours, both with beautiful results. Cooking it for the full time gives you more crispy bark on the outside of the meat and really crisps up the cracklin’, which some would argue is the best part of the whole thing! This recipe is adapted from a recipe in Nigella Bites by Nigella Lawson for Slow-Roasted Aromatic Shoulder of Pork. One thing that I find perplexing about this recipe is that you cook the shoulder for the majority of the time skin/fat side down. One would think that the fat should be on top in order to permeate the meat with fatty, juicy goodness, however cooking it skin side down allows the fat to render from the craklin, creating crispy, yummy goodness. If you want to try cooking it skin side up the whole time, let it rip. You really have to try hard to mess this up. 1 head of garlic, peeled and grated on a microplane (my favorite kitchen gadget) or minced then mashed to a paste with the flat of your knife. Preheat oven to 500 degrees. You should probably turn your exhaust fan on too. Mix all ingredients except for the pork together in a bowl. Score the skin of the shoulder diagonally across about every inch (see picture below), then crisscross the scores, making diamond shapes on the skin much like one of those old-school hams with cloves poked into the diamonds. Using a forklift, pulley system, or well-developed biceps, lug the darn thing to a rack in a roasting pan and nestle it in there. Pour half of the ginger/garlic mixture over the pork, massaging the goodness into all of the scored crevices. This is the Pork Spa. With your large biceps or pulley system/hand trucks, etc., again lug the roasting pan with the shoulder in it over to the oven and hoist it in. Cook at 500 degrees for 30 minutes. Remove the shoulder from the oven, turn it over so it is skin side down. Nigella recommends using your oven mitts to do this, then throwing them in the wash. Those silicone heat-proof gloves that come with turkey fryers work well too, or you can form a team and attack it with barbeque forks and tongs. Pour the remainder of the ginger/garlic mixture over the pork. Turn the oven down to 225 degrees and put the pork back in for its 24 hour nap. When you are ready to serve, remove the pork and flip it skin side up using whatever method you deem best. Turn the oven back up to 500 degrees and cook the pork for 30 final minutes, crisping everything up. Remove from the oven and allow to cool slightly. Shred the pork using two forks to pull the strands apart, or if cool enough, use (clean) hands. Below are recipes for two different sauces that go beautifully with the pork (or really with just about anything). The first is an Asian Barbeque sauce that I cannot take credit for. I adapted it from Charles Davidson’s recipe. I met Charles when I briefly lived in Missoula, Montana. He owned a restaurant called (I think–it’s been a while) the Blue Heron. It was a wonderful restaurant and Charles and his restaurant partner, Adam let me help out around the kitchen (I was thinking of becoming a chef). They used this sauce on an amazing pizza with shrimp, red onion, and tomato. It also makes a phenomenal sauce for wings or a tennis shoe, or just about anything. By the way, you might want to saddle up and visit your local Asian Grocer to buy the ingredients. It is cheaper than getting them at the regular grocer and you can find everything in one place. Except for the ketchup, but you probably already have that. Heat 1/4 cup of oil on medium heat in a sauce pan. Add shallot, garlic, jalapeno, and ginger and cook for 5 minutes, stirring occasionally. Add soy sauce through orange juice to the pan. Bring to a simmer and cook over low heat for 30 minutes until thickened. Remove from heat and add sesame oil. Puree with an immersion blender or allow to cool and puree in a blender or food processor. I thought this would do well with the pork because it references, very distantly the vinegar based sauces from North Carolina, Asian style. My mom brought me back a bottle of this from a recent trip to Hawaii and begged me to replicate it. They served it as a dipping sauce for foccacia, which would be awesome! 2 cloves of garlic, grated with a microplane or minced to a paste. Heat vinegar, water, mirin, salt, and sugar over medium heat, stirring until the sugar dissolves. Add garlic and Sambal Oelek and cook over low heat for 5 minutes. What do I do with this pork if I don’t want to just serve it straight up? 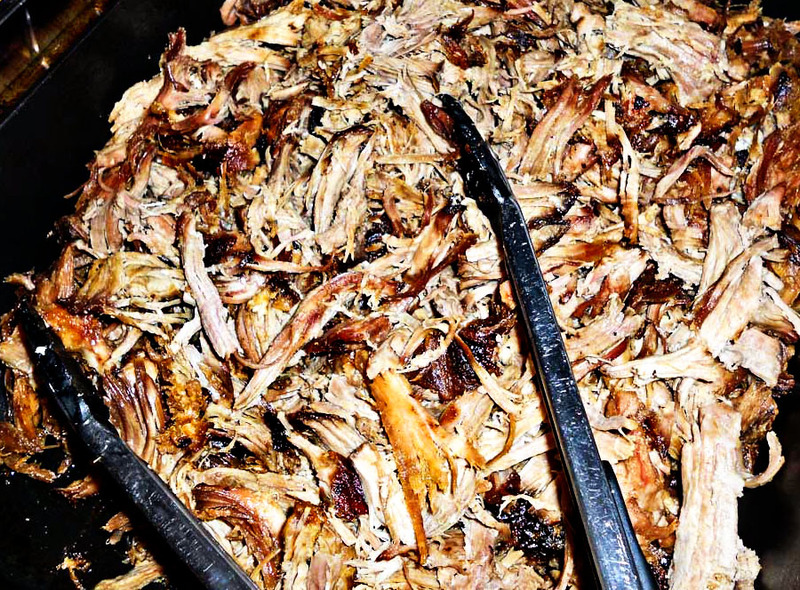 Below is a fantastic slaw that goes really well with the pork. We took the leftovers and made our own version of the very trendy Korean Taco. We also took the slaw and cooked it with an egg and the chopped, leftover pork, slathered some Mandarin Pancakes with the Asian Barbeque sauce and made our own version of Moo Shu Pork. The possibilities are endless. This recipe is not Kimchi, nor is it trying to be. I just wanted to reference the feel of Kimchi, if that makes sense. Combine dressing ingredients together and toss with slaw. Cover and let marinate in the fridge for at least 3 hours before serving. 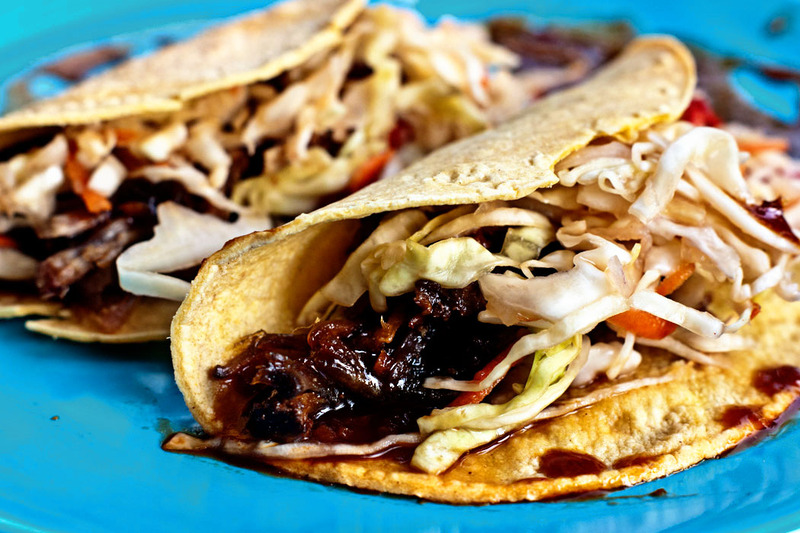 *To make the tacos, toss the pork with the Asian Barbeque Sauce, grab a corn (or flour if you wish) tortilla, stuff with pork and slaw. Eat. Yum.